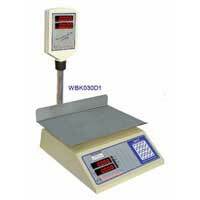 We are well-reckoned as Price Computing Scale Manufacturer, Supplier and Exporter from New Delhi, India. Price Computing Scale, offered by us, is legal for trade scales of various industries. We make Price Computing Scale by using finest parts and components, which we obtain from the reliable sources. In addition to this, we utilize latest technologies in the making of Price Computing Scales. Our Price Computing Scales are globally appreciated for their efficiency and dependability. Clients can avail the Price Computing Scale from us at very cost-effective prices.